I remember my first airplane ride, when my traveling companion told me that we were going to Canada, a vast land of forest, prairie, and mountains. My eyes lit up when he mentioned the mountains. I had only been away from my home in Switzerland for a few hours, yet already I was missing the mountains. When I was a very young bear, I would stand on my bed so that I could look out my window, and see the snow covered Alps. Later, when I was at Bear School, I would sometimes stop in the playground to look up at the sun drenched slopes of Mont Blanc, the highest peak in the Alps. My friends would laugh at me, saying how can something be “drenched” in sun? I didn’t care what they said, I still loved the mountains. Leaving the mountains was the hardest thing that I have ever done – except for leaving my family, of course. I knew it would not be exactly the same, but I thought that if Canada had mountains, at least I would have something comfort me when I was homesick. Imagine my surprise when my traveling companion told me that even though we would be in the same country as the mountains, we would still be 3000 kilometres away from them. Three thousand kilometres! Imagine that. Frankly, I simply could not imagine it. I was convinced that he was playing a trick on me, so I laughed at him and had a little nap. While I was sleeping, I dreamt I was standing by my window, looking at the most beautiful mountain I had ever seen. I woke up as the plane was landing, and was very excited to be in my new home. As drove away from the airport, I was looking out all the windows, trying to see the mountains. Slowly, the horrible truth dawned on me. My traveling companion had been telling the truth! The mountains were very far away. I was very homesick for a few days, but then I was introduced to the most wonderful grade 3 class in Stittsville. They made me feel very welcome, and soon I felt right at home. I almost never thought about the mountains. 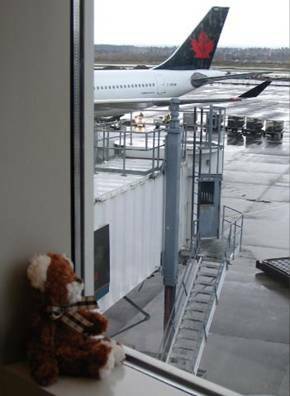 Then my traveling companion began taking me on trips, and soon I was lost in the excitement of seeing the world. One evening my traveling companion told me that he had a surprise for me. The very next day we were going to fly right across Canada, to a city called Vancouver. He waited a moment for me to think about where I would be if I flew right across Canada. Suddenly my eyes opened wide as I realized what this must mean. I looked at him, my eyes gleaming with excitement. “Does that mean…?” He laughed and told me that I was right. 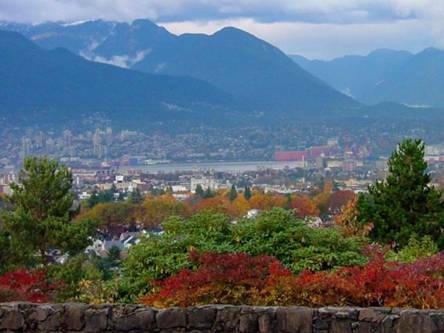 In Vancouver you can see the mountains, very much like you can in Geneva. I was so happy that I ran over and gave him a great big bear hug, taking extra care to make sure that my claws didn’t stick out. I don’t think he would have been too pleased if I had hugged him with my claws out. I was so excited that I hardly slept at all that night. My suitcase was packed, and I was ready for Vancouver. We arrived at the airport, checked our bags and headed for the gate. Once we boarded the plane I relaxed, and suddenly I realized just how tired I was. The next thing I knew, my traveling companion was shaking me, and telling me to wake up. When he said “we’re here” I was suddenly wide awake. As soon as we were off the plane, I rushed to the nearest window, and looked for the mountains. It was a dull, overcast day, and all I could see was the airport. I think my traveling companion could see how disappointed I was, because he told me not to worry. He assured me that I would see the mountains soon enough. I looked him straight in the eye, and told him that it couldn’t be soon enough. He laughed and took me by the hand as we went to collect our bags. As the taxi drove us into Vancouver, the fog began to clear. I could see more and more of the city, and even what looked like hills. Then suddenly, as we came around a curve, there they were – the mountains. I asked the taxi driver to stop, and I got out and just looked for at least 5 minutes. When I got back in the taxi, my traveling companion gave me a tissue to wipe the tears from my eyes. I couldn’t believe how happy I was. The rest of the week I was in heaven. Our hotel was over a kilometre from the conference, so we walked through the streets of Vancouver every morning and evening. 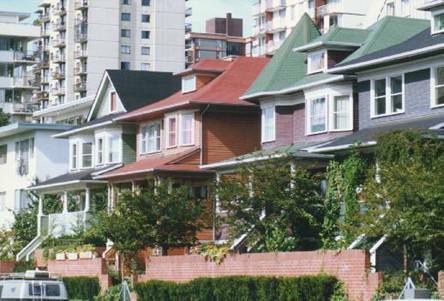 There were so many interesting old houses mixed right in with high-rise apartment building. I found it all very interesting. One day, as we were looking for someplace to have lunch, we found a Japanese restaurant. My traveling companion suggested that we give it a try, and since I love Japanese food, I agreed. As we were going in, we saw the strangest sight. 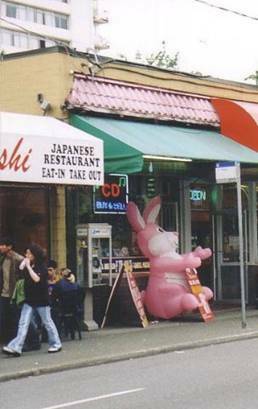 A giant pink rabbit was sitting in front of a nearby store. He looked lost, so I asked him if I could help him. He must have been very shy, because he wouldn’t say anything to me at all. When I asked him if he wanted to join us for lunch, he shook his head. So we went by ourselves, and had a wonderful lunch. I learned that there are many Japanese people in Vancouver, and even more Chinese. Since we had been in Japan just a few weeks earlier, it almost made me feel at home. All too soon, the trip was over, and I waved goodbye to the mountains once again. Who knows when I will have the chance to see them again, but I was happy for the brief visit that I had. I gave my traveling companion another hug as the plane took off. I lay back in my seat with a smile on my face.